When I reviewed BBC’s Sherlock last year, I noted that CBS was planning its own rip-off version of the Sherlock Holmes character, seemingly to ride on the success of the BBC version. 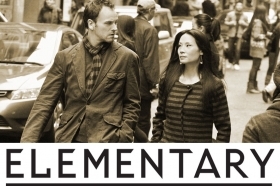 After watching the first season of Elementary, which concluded with a two hour season finale last week, I’m glad I waited to do a review of the show, since my conclusions now are vastly different from the ones that I would have drawn when the show was just a few episodes into its freshman season. The set up of the show is that Sherlock Holmes lives in New York City (yes he’s still British), while recovering from a stint in rehab after crashing from a serious heroin addiction problem. Dr Joan Watson is hired by Holmes’s off screen aloof and distant father to be his sober companion, to assist in Holmes’s recovery. As part of her job she moves in with Holmes and follows him around to make sure he doesn’t relapse. From that starting point, Holmes resumes his relationship with the NYPD as “consulting detective;” similar to the position he held in London with Scotland Yard. After watching the first couple of episodes, my feelings toward the show was that it was a well crafted TV show, well done in the sense that CBS has long experience with putting together solid television programming, with solid leads in the roles, but that it wasn’t Sherlock Holmes. Although the Holmes stories are the template of the eccentric detective and side kick, which have proliferated on television since the beginning of the TV era, those shows were not Sherlock Holmes stories. Psych is a good solid show with witty wordplay and a humorous bent about an eccentric genius detective and his down to earth side kick that helps keep him grounded. Monk was a good solid show with light fun stories about an eccentric detective and a down to earth side kick… well, you get the idea. It’s a common TV template that’s been replicated over and over for years; with various degrees of success. That was my initial conclusion. Elementary was a good solid show, but there was no need for the characters to be named Holmes and Watson. They could have any names and it wouldn’t have mattered to the show. The last half of the season very slowly began to explore the reasons for Holmes’s spiraling drug abuse, the murder of his one true love, Irene Adler, and Holmes inability to solve her murder. In the episode, “M” Holmes confronts murders done in almost identical matter to the one that killed Irene Adler and revealing whom may be ultimately responsible, Moriarty. From this point, the shows seem a bit less stand alone adventures and more interlinked stories that eventually form a story arc leading to a fantastic and fulfilling season finale. All of the pieces finally fit. So that’s why I’m glad I waited to review the show. It turned out to be much more than I initially thought, and even if CBS is trying to ride the coattails of Sherlock, since it leads to a quality show that deserves to be Holmes in its own right, who cares?